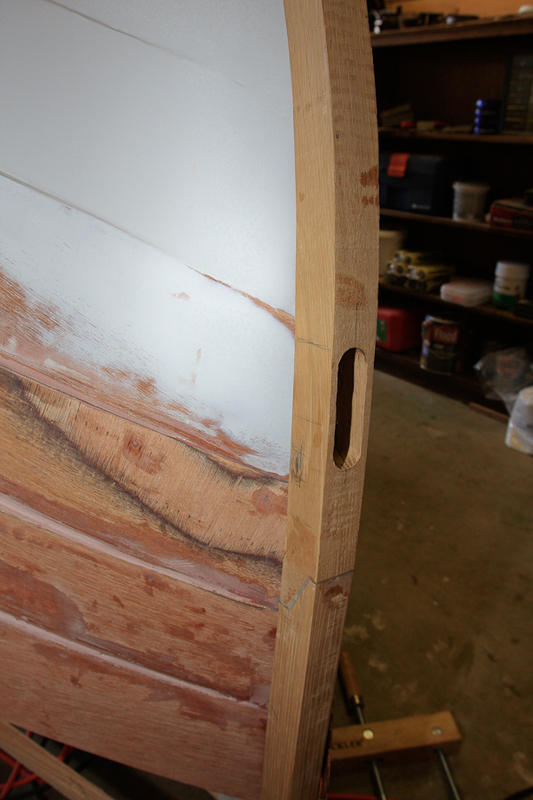 This week I added another two of the planks to the hull and made the cutout for the outboard motor. Outboard motor well is forward of the rudder, which will make motoring around the bay an easy task. (Update on 8/10/10) I received a comment from a reader that pointed out that I have interpreted the plans incorrectly for the keel aft edge. 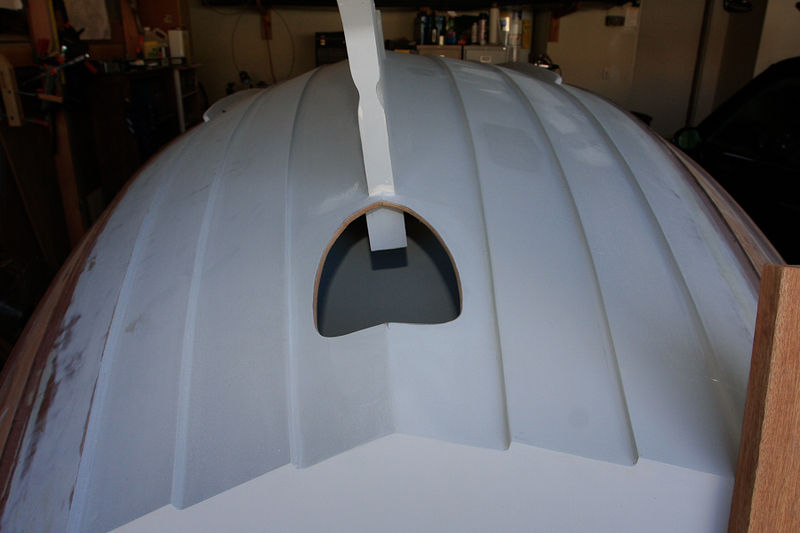 To improve propeller efficiency the aft edge of the outer keel is streamlined. (see longitudinal structure plan). I took the plan literally and made a narrowing that somewhat matched what I saw on the plan. See the photo above. I only have a very narrrow indentation around the propeller shaft area. What I didn’t understand was how to read the plans as provided by the designer. What is necessary is a narrowing of the entire edge the WIDTH of the propeller and not just the small area that I accomplished. Future photo’s will show me changing this, but at the current time the hull has been painted and turned over, so I will not be making the improvement until nearly launch date. If you build the Ebihen 15 don’t use my photo above as a reference for your own boat. I also roughed in the bow stem for location and placement of my u-shaped bow hook. I deviated from plans here. The original plan called for a laminated stem. I choose to make a scarfed solid oak stem. The plans call for only a hole cut into the laminated stem and a loop of rope. I want a bow hook that is attached directly to the boats backbone. I purchased a stainless steel U-bolt that is bolted directly through the backbone. It will not be a classic look, but I believe a much stronger and easier attachment location for the bowspirit and trailer straps. A solid U-Bolt will be attached to the boats backbone. 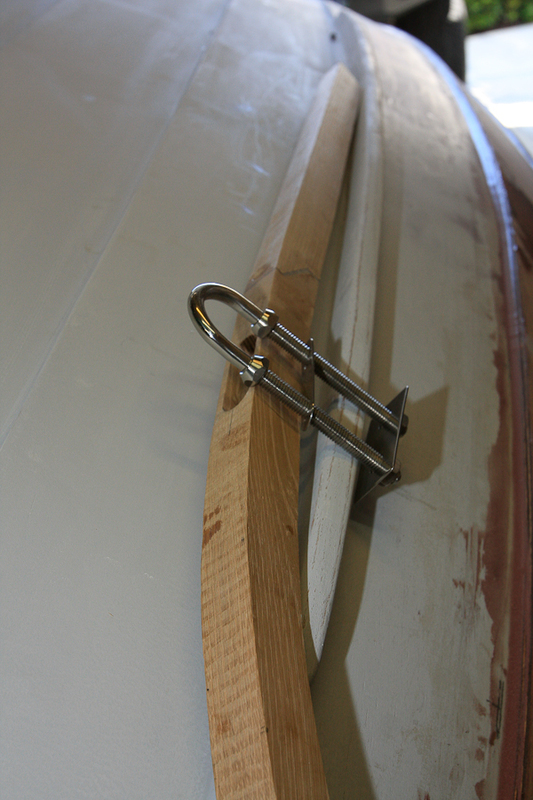 A solid anchor point for the bow spirit and trailer hooks. how can ı cut outboard motor? there is no cuttıng template in the plans. How did you handle it you? I used a paper template I cut out based on my motor’s width and length. I was pretty careful about my measurements so that the cut out would fit into the available space. Be sure not to exceed the opening available, leaving at least 5 mm from each transverse bulkhead. The plans indicate 185 mm is convenient in most cases. The designer recommends to keep the hole at minimum size to fit your motor. I had a cheap ZIP router I used to cut the rough shape, and then hand filed and sanded to final size. All your cuts are so perfect! You are a pillar of patience.